Kids love playing on tablets and smart phones, and I think the excellent Nexus 7 will be a popular choice for Christmas Stockings this year. Apparently though in-app purchases for children’s mobile games are costing parents around the world nearly $1.5 billion a year, and there are often stories in the press of individual children accidently racking up huge bills for their parents. Regulators around the world are starting to look into this practice but until then lock or disable your phones/tablets ability to make these purchases before handing it to a click happy child. 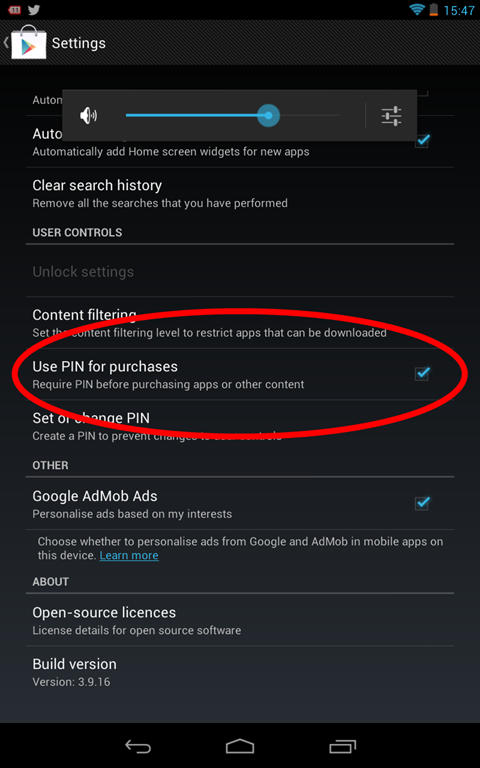 On android follow these instructions to setup a PIN within the Google Play App and then use that PIN to protect all app purchases (see screenshot on the right). If you’re an Apple user then since version 4.3 iOS apparently requires the user to enter their iTunes password for in-app purchases by default. what I see so now i’m following you. Look forward to looking over your web page repeatedly. Really great article. I recently located your blog site and wished to express that I’ve really treasured checking your web site blogposts. Of course I am opt-in inside your rss feed so i do hope you produce one more time immediately!